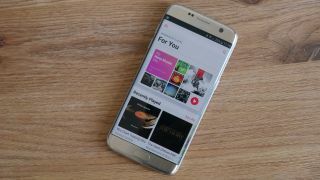 Apple Music is the latest addition to Three's Go Binge platform that allows you to stream video and music to your phone from certain services without using any of your mobile data. Go Binge is a specific plan available to Three customers who have taken the service, and Apple Music is set to join Deezer and Soundcloud as your ways to stream music directly to your phone. You'll need to pay for the Apple Music subscription itself, but when you're streaming music from the service it won't use any of your data. You can also stream video from Netflix, TVPlayer, Dave, History or the Lifetime channel too. Whether you have Go Binge activated on your device depends on when you last upgraded or when you joined Three. It's only available to those on recently-bought Advanced or SIM Only deals with 4GB of data or more a month as well as pay monthly broadband plans with 5GB or more. If you're an existing Three customer and don't have Go Binge activated, you'll need to upgrade your contract to one with more data (but it has to be over 4GB) and possibly pay a surcharge as well. Those who are still uncertain whether Go Binge is activated on their account can contact Three here to find out.